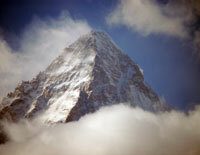 A member of the K2 Polish team was injured by rockfall. While serious, he will continue climbing. Over on Everest, they remain locked down at base camp waiting out the weather but hope to start the summit push next week. Of all the objective dangers in climbing mountains, rockfall might be the one most feared. Along with avalanches and “disappearance” rocks hitting climbers are the most common dangers on K2. What makes rockfall on K2 so serious is the angle of the slopes – once a rock gets going, it becomes a deadly missile – without warning. Climber wear helmets but they do little to stop a moderate size rock zooming down a steep face. deven small rocks can cause serious injury. In 2015, Kami Sherpa had his shoulder dislocated and arm broken when he was hit by a rock on the Abruzzi Ridge. In 2006 Irish Climber Gerard McDonnell was hit in the head by falling rock and had to be helicoptered off the Hill. The Polish team took advantage of a low-wind day to continue their acclimatization rotations. After sleeping at Camp 1, Maciek Bedrejczuk then went to Camp 2 at 6,300-meters. Janusz Golab and Adam Bielecki left base camp towards Camp 1 at 5,900-meters. But the big news was that while only 100 meters below Camp 1, a falling rock hit Adam Bielecki in the face breaking his nose. He was helped back to base camp by two high-altitude ports where he received six stitches to close a large gash. He never lost consciousness and will return to the climb after a few days of rest. The team reported a snowstorm at base camp but the next few days should be good enough to make progress to Camp 3 with winds right at the edge of 30 mph/50 kph. Alex Txikon and the team continue to stay at base camp after reaching 7,850 meters between Camp 3 and the South Col. The winds continue to be too strong to climb higher – 70 mph/112 kph at the South Col. The computer models show strong winds for the rest of the week, but that can change quickly. Team is resting on base camp. Weather is very bad. Wind is blowing at approximately 70mi/hr tearing down our tents. Some portions of khumbu ice fall has collapsed near camp one. 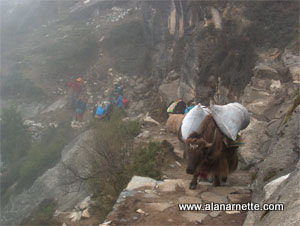 A team of sherpas headed by me has fixed the ropes and ladders again. We got the report of a clear weather window after Feb 11. Hopefully we’ll push for summit in coming week. All team members are in great shape and health. It’s over for the Pakistani climbers attempting the first winter summit 7200 meter Masherbrum West Peak aka Masherbrum 2; too much snow. Maaz Maqsood. has lots of pictures on his Facebook page. Simone Moro and Tamara Lunger established their Camp 1 in perfect weather according to his Facebook post. He notes that it is cold, -40/45°C and there is a lot of snow. They are attempting Pik Pobeda, 3003 meters, in the Siberia’s Chersky Range region.